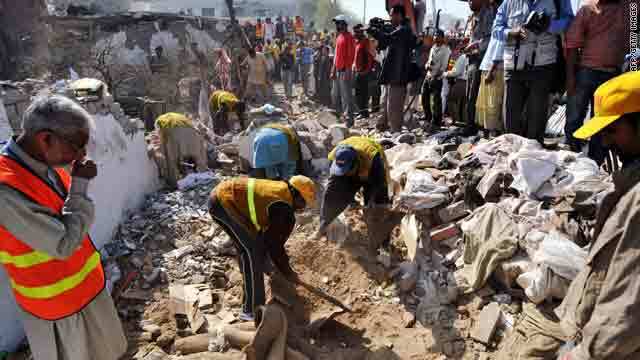 Volunteers search for victims Monday in the rubble of a destroyed building after a suicide attack in Lahore, Pakistan. (CNN) -- The Taliban said Monday it was behind a suicide bombing in the eastern Pakistani city of Lahore that killed 13 people and wounded 113 others. Azam Tariq, spokesman for the Pakistani Taliban, said the attack was in response to U.S. aggression against Muslims around the world. "I am proud to accept the responsibility of the Lahore suicide blast," Tariq wrote in a text message to CNN. "We will follow U.S. and its allies all over the world, even if they are in Karachi, Peshawar, Lahore, Afghanistan or in U.S."
Seven of the dead were security personnel, and two were a mother and daughter on their way to school, Lahore government official Khalid Ranjha said. He said 81 people were at nearby hospitals. Government officials earlier reported 11 people were dead and more than 60 were injured, with many in critical condition. Officials warned the death toll could rise. The bombing was in an affluent part of Model Town in Lahore, Pakistan's second-largest city. The suicide bomber targeted the Special Investigation Agency, a provincial law-enforcement agency that investigates high-value detainees. It is where suspected militants have been interrogated, said Khusro Pervez, a senior government official in Lahore. In a separate development, three suspected militants were killed Monday night when a suspected U.S. drone fired five missiles at a compound in Pakistan's tribal region, two Pakistani intelligence officials said. The compound was in the town of Miranshah in North Waziristan, one of seven districts in Pakistan's tribal region bordering Afghanistan, officials said. CNN's Reza Sayah and journalists Nasir Dawar and Nasir Habib contributed to this report.